“South Georgia is for those who grew up dreaming of a Garden of Eden where you would walk unharmed among abundant and fearless wildlife in a beautiful wilderness – an oasis of serenity in a world increasingly out of step with nature.” Tim and Pauline Carr, Antarctic Oasis, Under the Spell of South Georgia. South Georgia and the South Sandwich Islands (SGSSI) is a British Overseas Territory in the southern Atlantic Ocean. South Georgia is 165km long and between 1 and 35km wide. Captain James Cook made the first landing here in 1775 and claimed the territory for the Kingdom of Great Britain, naming it the Isle of Georgia in honour of King George III. For a while it was an important base for whaling which thankfully ended in the 1960s – these stations were unpleasant and dangerous places to work and nearly destroyed the whale population. Now there’s no permanent population on the island. It’s an isolated and rugged (inhospitable even) place, especially in the winter. Around 10-20 scientists, support staff and museum staff come and go through the year. And of course travellers like me, coming to visit the penguins, seals and whales in their natural environment. Nothing can prepare you for South Georgia. That first glimpse of Salisbury Plain from the ship’s deck takes your breath away and you can hear and even smell the penguin life in the distance. Oh and some little gentoo penguins swam serenely past my window when I opened my curtains. We’d made it to this magnificent island where few humans ever go. Time for our first on-shore expedition. Jumping into little Zodiac inflatables it started to feel like this was really happening. We were about to step foot on the land of penguins. Salisbury Plain is home to one of the largest king penguin colonies in the world – there are tens of thousands of them! 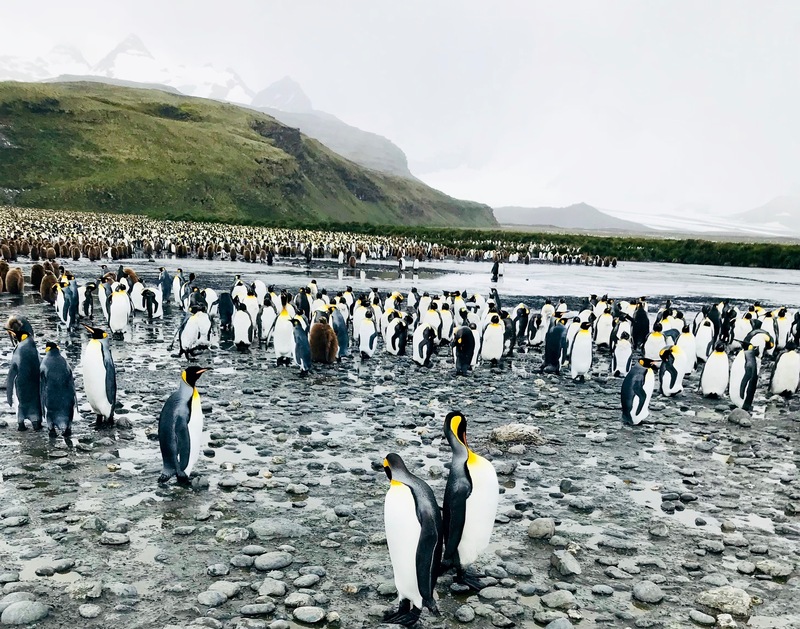 It’s impossible to explain the impact that first penguin sighting has – with what looks like a carpet of them stretched out towards the mountains – a very large carpet. King penguins aren’t scared of humans – who they don’t see that often. Some look at you curiously – in a “What are these big red things doing in our house” kind of way (we all wore the red expedition jackets that came as part of the cruise), but mainly they continue going about their daily business like there’s nothing unusual going on. As well as king penguins (so many of them) we also communed with seals. Fortuna Bay was home to the elephant variety. 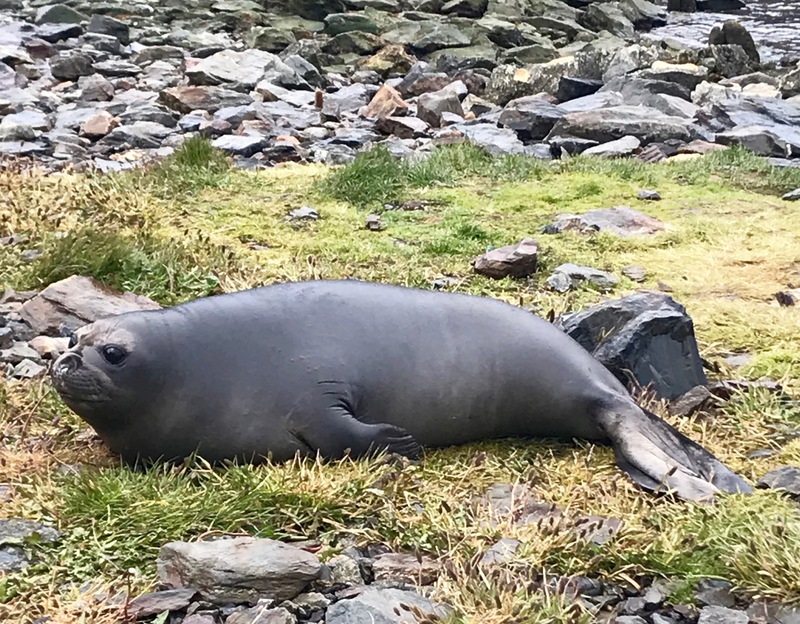 The biggest of them are out at sea feeding at this time of year so we only saw babies (weighing in at about 1000kg) and juveniles (weighing in at up to 3000kg). These are big, quite smelly and noisy animals that emit a sound like a cross between a sneeze and a burp. The babies are so tame and curious they come right up to you trying to suckle – their mothers are out at sea feeding. They look pleadingly up at you with their big brown eyes before latching on to your boot or trousers, obviously with disappointing results. The elephant seal is probably the biggest baby I’ve ever seen! And then there’s the fur seals. By far the cutest-looking of their species, they’re also by far the most aggressive. Fierce about protecting their territory, the adults have no hesitation in charging you and have even been known to bite. And like the penguins you get incredibly close to them – though we tried to keep our distance! Didn’t like the look of them getting ready to charge. We saw lots of babies on this trip! 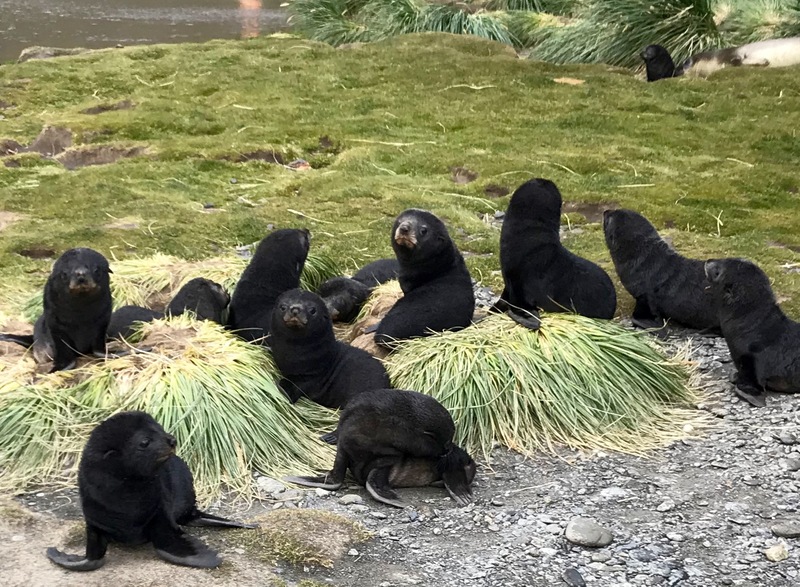 The fur seal babies were unbelievably cute, the sort of animal you want to take home with you with their pretty faces and soft-looking black fur. Of course you’d never be able to do that and actually you really wouldn’t want to as they are born aggressive. The vicious-sounding growls that come from them as you walk past are quite startling! You’ll be noticing that I also couldn’t resist taking pictures with our lovely ship Le Lyrial in the background. After our magical penguin and seal-filled day we headed for Stromness and Grytviken. Stromness was a whaling station from 1907 to 1931. It is also known as being the arrival point of Ernest Shackleton after his epic journey from Elephant Island. Now this an amazing story! In April 1916, Ernest Shackleton’s Imperial Trans-Antarctic Expedition became stranded on Elephant Island which is about 1,300km (800 miles) south-west of South Georgia. Shackleton and five of his men set out in a small boat (I mean a very small boat) to summon help and on 10 May they landed at King Haakon Bay on South Georgia’s south coast. 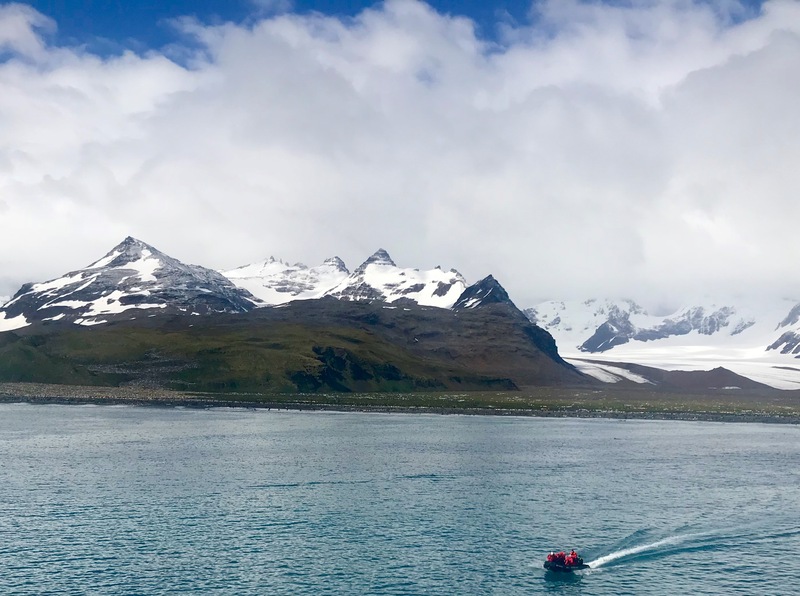 I did a similar journey on this cruise and we passed by the hostile-looking, isolated Elephant Island on our way from South Georgia to Antarctica. It’s a long way and there’s nothing in between! Okay it was highly enjoyable onboard a luxury ship, but I can’t imagine how difficult it must have been for them to get there alive! Especially as they’d already had some epic travels. And to make matters worse they discovered on landing that they were on the wrong side of the island. So Shackleton, Tom Crean and Frank Worsley had to walk 22 miles over the spine of the mountainous island to reach help at Stromness. Legend goes they were welcomed at Stromness by Norwegian Thoralf Sorlie with the words: “Who the hell are you?”. They definitely weren’t looking their best! They’d left 22 members of the expedition on Elephant Island who were subsequently rescued. They’d survived living under two of the upturned boats and were all still alive when Shackleton returned. Shackleton’s story is one of hardship and endeavour, I guess that’s obvious in any exploration of the white, icy wilderness of Antarctica. The fact that he never lost a crew member reflects the bond he built with his fellow explorers and his determination to be a solid leader. It’s interesting if you google him – there are myriad sites about him, his obsessional mission to reach the South Pole first (a mission he failed to achieve – in fact he never reached the Pole at all). And some dubious personal decisions including the fact that he allegedly cheated on his wife and more or less abandoned his children. How he had the time and energy for any of that is another mystery. Whatever the truth, he was undoubtedly someone you’d want on your side when trouble came, trouble we can’t possibly even understand in today’s world. I could discuss this forever but it’s time to move on..well, sort of. Our next stop was Grytviken, home to Shackleton’s grave, a museum and the rusty remains of a whaling station. 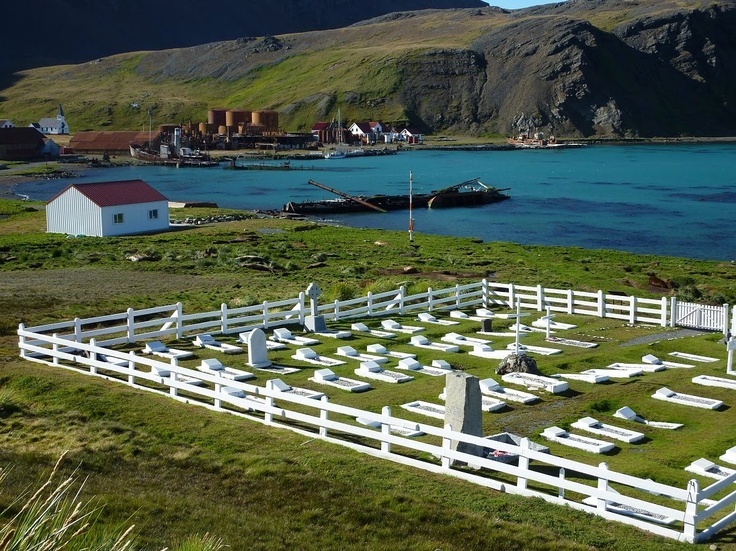 It’s such a moving experience visiting his grave, surrounded by a white picket fence in the desolate remains of the whaling station. We all had a toast to “The Boss”, as he was known, with a shot of Jameson’s Whisky, half of which we poured on his grave (as is the custom), while pondering how it was physically possible to do what he did with the very limited resources he had available. 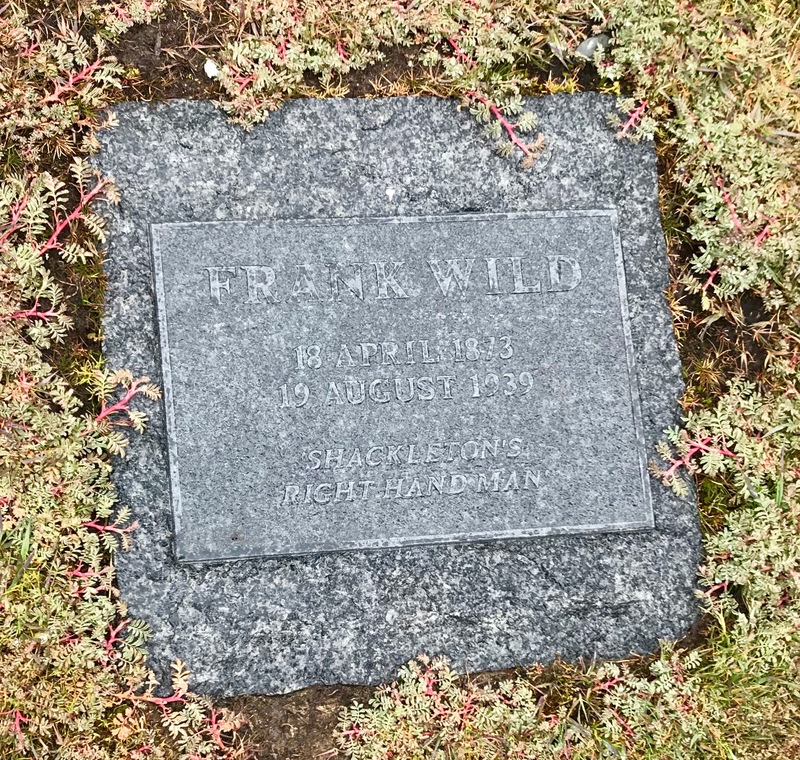 The ashes of another noted Antarctic explorer, Frank Wild, who had been Shackleton’s second-in-command on the Imperial Trans-Antarctic Expedition, were interred next to Shackleton in 2011. These explorers were made of different stuff! The stuff of legends. Our final onshore expedition in glorious South Georgia was in Gold Harbour. An amphitheatre of hanging glaciers and cliffs rises from the sea creating the most beautiful backdrop for the ever-abundant wildlife. By now I was totally in love with the gentoo penguins, smaller and daintier than the kings, with their bright reddy-orange beaks and beautifully curious personalities. We found their nesting grounds in the tussock hillside (after wading through a lot of mud!). 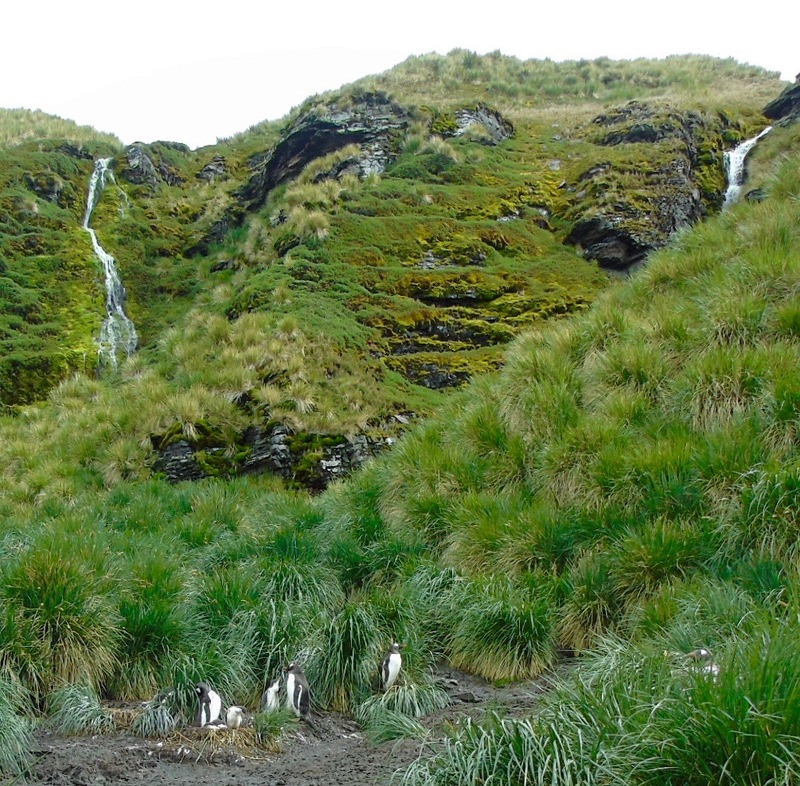 The gentoos breed under the fluffy tussock grass. And we spent more time communing with the lovely kings and their families. Some of them nesting their eggs under their down, balanced on their feet. 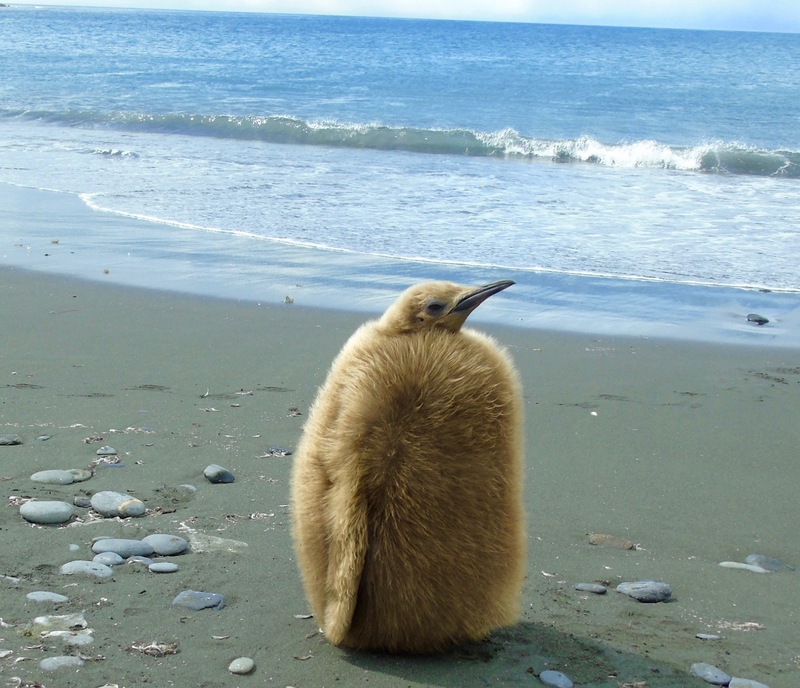 The edge of the colony had plenty of the brown, fluffy chicks, yet to moult their fur and become elegance in black, white and yellow. 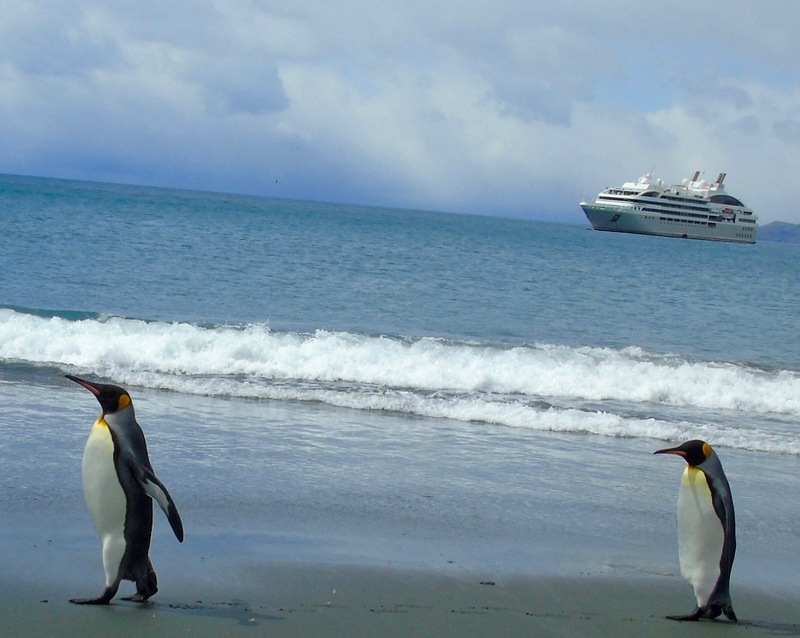 I cruised The Falklands, South Georgia and Antarctica aboard Le Lyrial on a fabulous Abercrombie & Kent expedition. 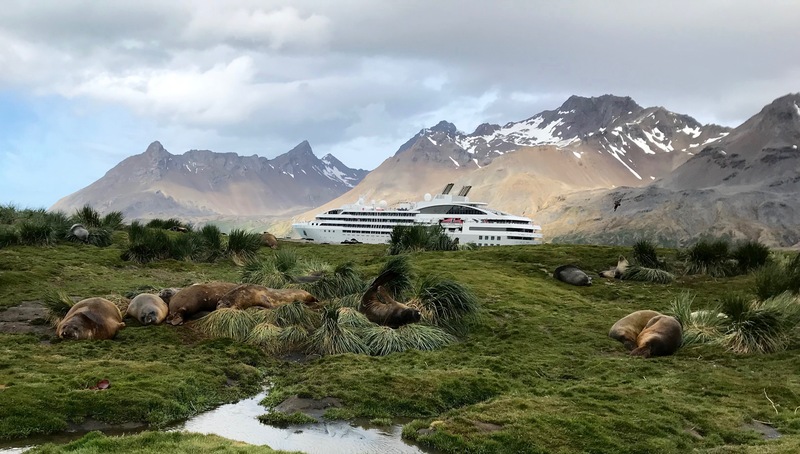 We embarked and ended in Ushuaia, the capital of Tierra del Fuego, an island at the bottom of South America approximately a three-hour flight from Buenos Aires. Tierra de Fuego is half owned by Chile and half by Argentina. Ushuaia is officially called “The End of the World”, because it’s the southern-most populated city on our planet. And it does feel like you’re in the middle of nowhere – that is until you start heading east and then south discovering even more remote places. What an adventure. One that you will never truly understand until you’ve been there yourself. So go, seriously you have to go, and discover more about our fabulous planet and why we should be doing more to preserve it. 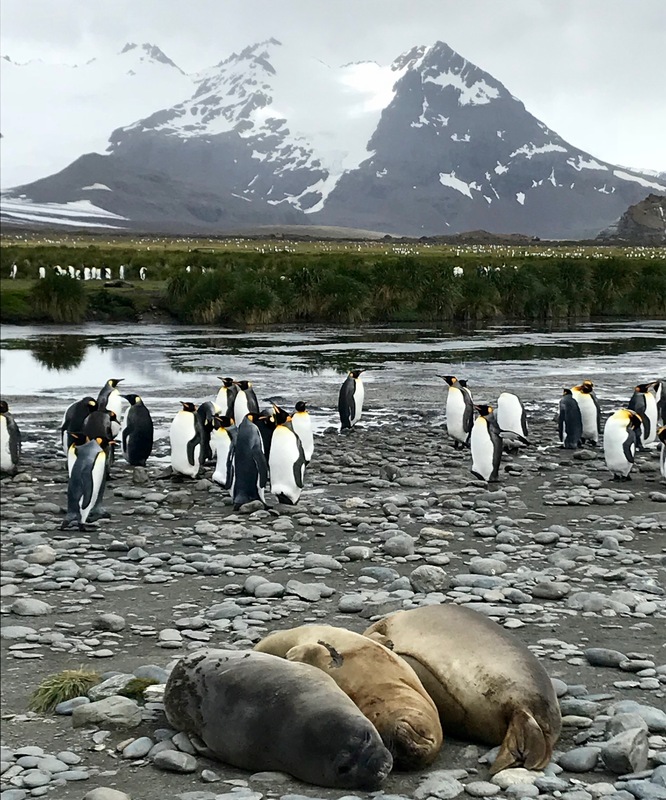 Escape to the land of penguins and seals, whales and albatrosses, absorb the peace and harmony and try to keep it in your soul. Well that’s what I’m trying to do. One of the expedition leaders Richard (AKA Black Jack) made a video of our unique experience which you can watch on YouTube by clicking here. I agree with you. It is an experienced for the rest of ones life. I am so jealous of this trip! One day!!! 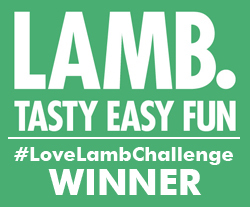 An absolutely amazing experience, you would love it Fiona. You have to do it, it is so amazing. I still can’t stop talking about it! Thank you. It will certainly stay with me forever. I miss South Georgia, it was so much more than I was expecting. Thank you, it was a truly magical and unrepeatable experience. I will never forget it. Ashamed to say I’d never heard of it before but now I’m desperate to visit! Thanks so much Lorial. South Georgia is truly the most wonderful place – I could have stood there all day watching those penguins. I miss them! Possibly the most beautiful place on earth with all those amazing penguins to watch for hours. Take me back there with you please! So many penguins. I loved my time there and really miss all those curious little birds.